Presentations generally begin with a brief introduction about me, THE RAIDERS OF FOLKLORE series, publishing in general, and then shift into a topical focus. Each presentation is roughly 60 minutes in length and includes time for Q & A and a book signing afterwards. To book me for your next school visit, please use the Contact Me form below. For some workshops, I offer a multiple-session program of 45 minutes each. In the first visit, I can discuss goals with the teacher. In the second session, I present the workshop content to students. In the third session, I give feedback to students on their work. A 60 minute Skype or Google Hangout call to your classroom. One signed paperback copy of THE EYE OF ODIN for your classroom. A 60 minute Skype or Google Hangout school visit. Six signed paperback copies of THE EYE OF ODIN for your classroom or library (perfect for a Literature Circle set). 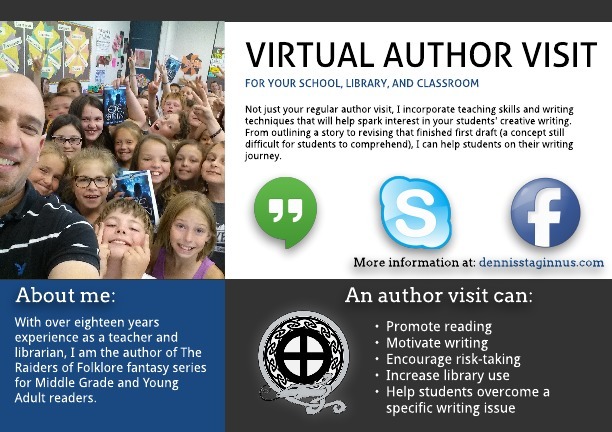 Three 60 minute Skype or Google Hangout school visits (consecutively on the same day please). 30 paperback copies of THE EYE OF ODIN (a value of over $200). Can be sent before our virtual visit.